Kitchen countertops are one of the most important parts of the kitchen design. They’re the workspace and the foundation for the design of your kitchen renovation. Your kitchen designer will give you a wide range of materials, color, designs and finishes that can work with your space and vision. Make sure to check out the latest trends with your kitchen designer in Christchurch for the newest in countertops. Patterns in the countertop give the kitchen more character. Realistic veining in quartz, marble, and granite can create a interesting match up to your cabinets and backsplash. Each vein is a unique picture made in the material to create a one of a kind story across the countertop. Veining can give a flat countertop more style and life to make a design have some interest. There are a number of different pattern types of veining but the two major ones are crack seal growth and open space filling. And there are different ways to display the veinging like cutting into it to show it from the inside or to cut the counter to let the vein be all the way across the space. A new trend has started where kitchen designers use the countertop materials turn a 4in the wall as a backsplash. Designer can still use backsplash materials but running the countertop up a bit the wall tunes down the details of the backsplash. If you would like a less busy design your kitchen designer Christchurch would probably recommend this. Another option is to use the countertop all the way up to the cabinets as a backsplash. This creates seamless lines and makes the design look clean clear and cohesive. Quarts is a timeless material that doesn’t seem to be going out of style and 2018 is no difference. It is loved because it is a natural beauty that is easy to clean and available in a vast array of colors and veining options. Every kind of cut is different and unique so that your countertops are always one of a kind. It is also easy to cut to give you the deges that you desire and allow you to fit any sink design that you wish. It is a great alternative to more expensive materials like marble, which can break your bank. Granite, soapstone and slate are also popular materials to make your countertops out of and allow you to have a wide variety of finishes as well. The island is just as important as the rest of the work space in the kitchen sometimes more so because the island provides you with the opportunity to create more workspace or to move the kitchen sink to a more central location. Whatever material, cut and color you choose for your countertops can also run kitchen island as well. If you’d like something with a bolder design and a little less matchy then you can pick a different material to cover your island worktop. This can be done with a butcher workspace and a quartz countertop to the bar side. Or maybe the cabinets of the island storage won’t match the rest of the cabinets in the kitchen. Your kitchen designer in Christchurch will be able to handle the design that meets your needs functionally and looks beautiful with a matching countertop as well. This worktop can either include a sink or it can be just extra work space with storage underneath. 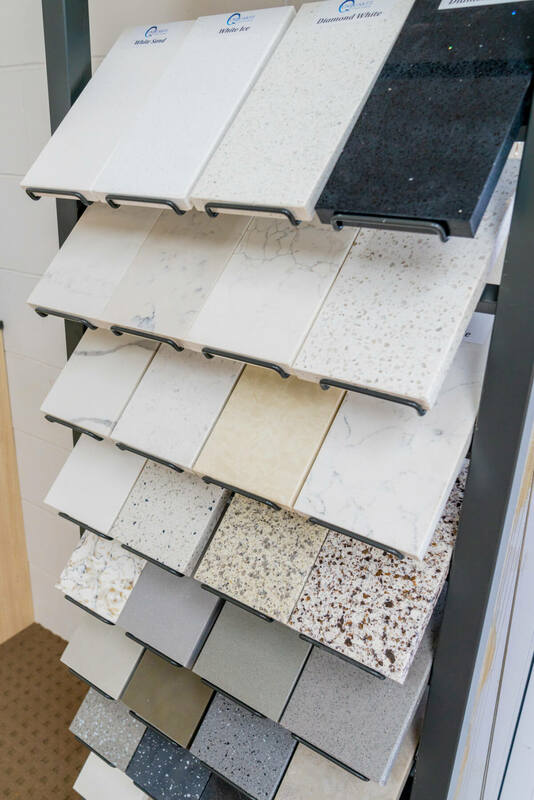 After you’ve chosen the material and color for your countertops it’s important to also choose the cut for the ends of the counter. Countertop edges are not something to overlook. It’s a small detail that can add an accent to your overall design. There are a number of different styles to countertop edges. A more modern trend is the waterfall edge that allows for the counter material to be taken all the way down the side of the workspace and meets the floor. This allows for clean and contemporary lines that is very sleek. A less modern edge is the cascade edge. A cascade edge is a more classic and traditional edge that clearing defines the end of the counter with some nice detail. Whatever edge you choose it should fit into your overall theme of your kitchen renovation. Remember that no detail is too small and the countertop edges are a detail that will make a big difference. When remodeling your kitchen there is a wide array of choices to make when it comes to kitchen countertops. Your kitchen designer will walk you through the latest trends to assure that the materials fit the overall design.From the materials like quartz or marble to veining options and how to showcase them when it comes to cutting the edges, you’ll be able to create one-of-a-kind look for your kitchen that you will love for years to come.